Director: George Miller. Cast: Magda Szubanski, James Cromwell, Mary Stein, Mickey Rooney, Julie Godfrey, voices of E.G. Daily, Glenne Headly, Steven Wright, Danny Mann, James Cosmo, Adam Goldberg, Roscoe Lee Browne. Screenplay: George Miller, Judy Morris, and Mark Lamprell. Like 1996's spectacular The Hunchback of Notre Dame, this sequel to Babe, that immensely pleasurable 1995 porker, seems destined to go underappreciated and underpatronized because its vision and achievements have been deemed "too dark" for the Happy Meal set. As with Hunchback, however, I don't think you can watch Babe: Pig in the City and form the understanding that the the MPAA apparently did, or that which the film's promoters were clearly bargaining for: namely, that director George Miller is all that concerned with attracting or endearing himself to the kiddies. Yes, this newer, more imposing, more elaborate Babe still has that cute-as-can-be hero(ine? ), and there's plenty of dazzle in the particolored conglomerate metropolis to catch a toddler's eye. Still, to assess the film as a juvenile entertainment is to miss the point that this Babeand arguably its predecessor, whose appeal for adults seemed if anything to exceed that of their childrenaims to recapture a youthful sensibility in more mature viewers. They are clever and eye-popping returns to the fanciful perspective of childhood, but are not necessarily best viewed from the vantage of a real five-year-old. For all those bewildered folks who wondered three years ago that the auteur behind the Road Warrior movies and even Lorenzo's Oil could take on such a spritely project, Babe: Pig in the City, which sees the old vet take the directing reins away from newcomer Chris Noonan, reconfirms that Miller has not jettisoned his dark and distinctly adult-flavored sensibilities. The animals (and there are two or three times more of them than inhabited Hoggett Farm) are often styled in ways that will make more sense or resonate more for grown-ups: a pink poodle that's a would-be Blanche DuBois, an insular family of chimpanzees, and that perfectly and riotously macabre duck, Ferdinand. Also, a few of the film's most memorable momentsas when a partially-paralyzed dog daydreams of heaven at the brink of mortality, or when an almost Lear-like orangutan (isn't that absurd?) refuses to be seen unclothed in front of the animal gaggle over which he once ruledrely on a mature sensibility for their considerable and unpredictable emotional heft. And yet, if Babe: Pig in the City does not find the audience that its predecessor did, I cannot say I will be bewildered or even too sorry. Rather than being a disguised grown-ups film that kids still enjoy, this shoulda-been-PG affair doesn't seem to know, or care, who exactly will be watching. I can't see many viewers of any age feeling entertained by the numerous scenes of impounding, hostile chases, or other imperilments that these animals must suffer, not to mention the unbelievably brutal way in which Farmer Hoggett is debilitated, though impermanently, and his farm consequently jeopardized at the picture's very outset. (The opening is perhaps the most shockingly assaultive toward our good will for the characters since David Fincher summarily annihilated almost his entire inherited cast in Alien³.) The film's most daring virtues, like its almost Felliniesque embrace of absurd situations and visual audacity for its own sake, will certainly appeal to some adults but not to those viewers who are hoping for a Babe redux. It's an ambitious and admirable effort, but an exclusive and frankly rather ornery one that almost makes you feel bad for being charmed and warmed by the first picture. Miller has made a film that he himself clearly loves more than almost any conceivable audience will be able to. There is every reason in the world why making a movie that appeals to yourself above all, and which embodies your philosophies without diluting them for commercial or popular appeal, should be read as a mark of artistic integrity. So, bravo George Miller, for pushing the envelopes of tone and black humor to the very edge of your own nascent franchise. Unfortunately, though, artistic integrity does not always make a film enjoyable to watch, and there were more than a few moments in Babe: Pig in the City when the lure of Roger Ford's production design or of those miraculously articulate creature-mouths was not enough to draw my eyes from that other spectacle, the face of my wristwatch. I can't imagine having been at all distracted from the first picture, which even after a dozen viewings seems to end well before I have gotten enough of it, and I thought that film was innovative and cinematic without segregating its audience. The primary objection I have is that the free reign given to production values and "vision" in this picture is generally at the expense of the hero himself, who is not given nearly as much to do this time out. The plot structure is deceptively loose and does not capitalize on the pig's proven strengths. I have a hard time reading his mini-successes in this filmsaving a drowning pitbull, freeing his friends from an all-species poundas plausibly connected to or as necessary byproducts of the mission to save Hoggett Farm established by that disconcerting first sequence. And when the animals who do surround you are as gruff as those chimpanzees or as cloying as that pink poodle, who cares from moment to moment what happens to them? It is harder to marvel at the fact that these animals can talk when nothing they say is very appealing or intriguing. Echoes of Tim Burton's Batman Returns resound in a picture that is a bigger visual feast than its predecessor but, emotionally and structurally, only a shadow of its former self. 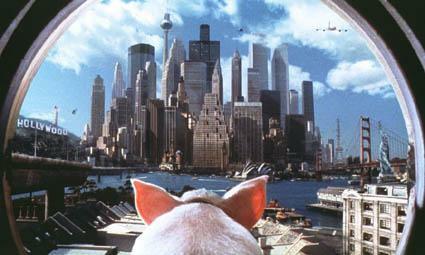 To be fair, Batman Returns was an acrid mess, while Babe: Pig in the City clearly accomplishes much of its own eccentric mission as the world's unlikeliest, most Metropolis-inspired commercial kid-flavored flick in years. Not to be ignored, either, are that gut-busting Ferdinand, who as in the first film I would have no problem nominating for Best Supporting Actor, or that barbershop trio of mice, whose operatic arias and Elvis impersonations demonstrate how hard those guys've been rehearsing since the sheep-herding finals. Best Original Song: "That'll Do"